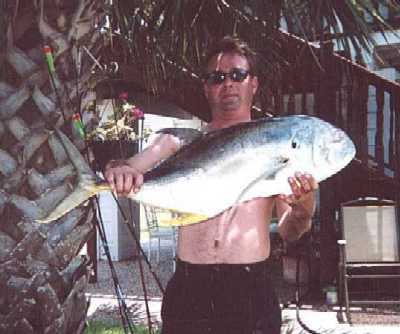 Gulf Coast Computers wants to post your fishing photo's here. Come by our office Monday-Friday from 10AM-6PM to drop it off. Photo on left, Stone Fitzgerald (age 4) and his father Curtis. 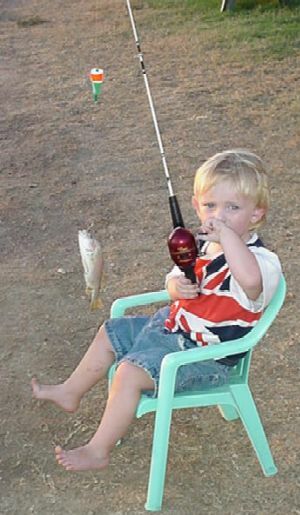 Stone cast, hooked, and reeled the fish in entirely by himself. 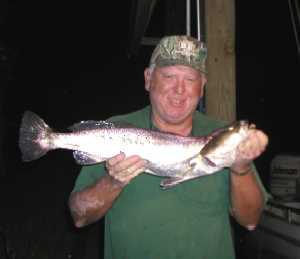 This speckled trout was caught in the canal behind Sailfish by Stone on a pumpkin, white and chartreuse Trout Killer. 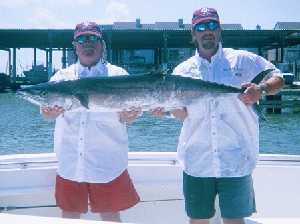 George Williams of 163 Baracuda caught this off the dock. 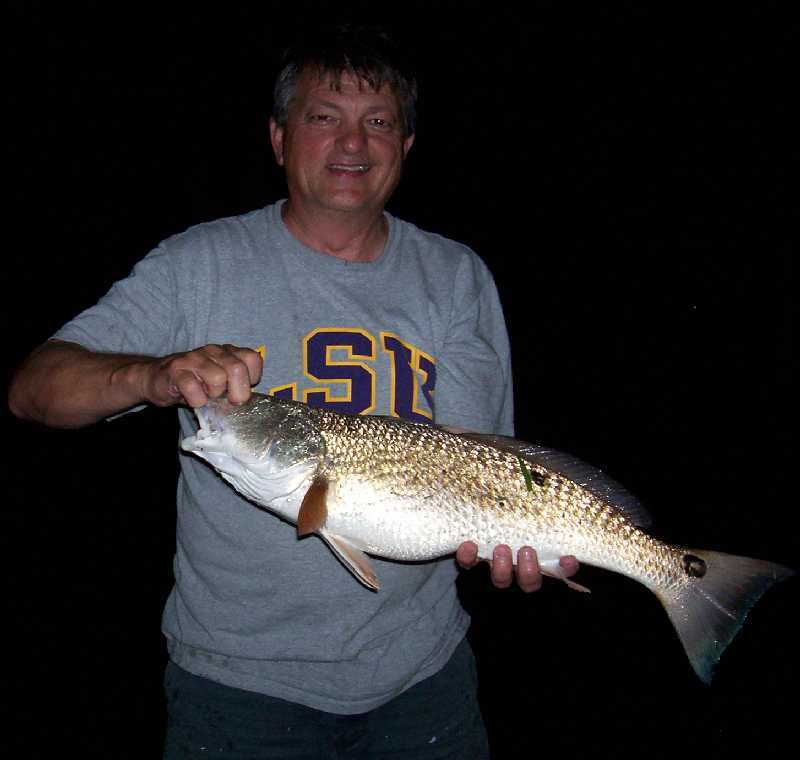 Residents of Bayou Vista that have bragging rights. Just look at the photos of these whoopersnappers (as our son Cole calls them). 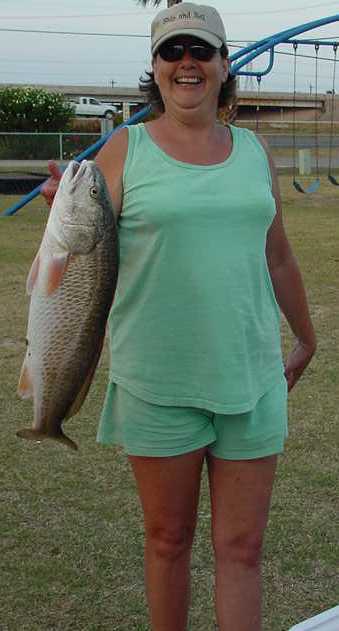 Sharon Pool, of Bayou Vista caught this Bull Red at Pelican Island Bridge with a Ultra Light Spin Cast with 10 lb test. 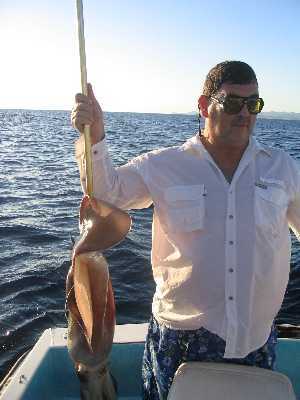 The battle lasted for 45 minutes, this amazing fish was caught using live finger mullet. 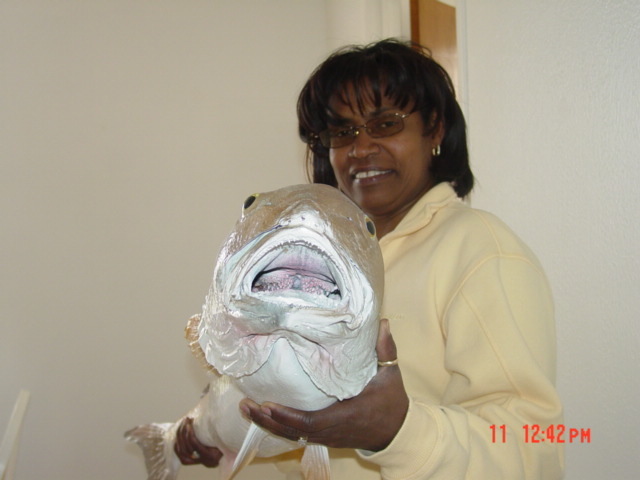 This fish was mounted and is on display at Sharons home in Bayou Vista. 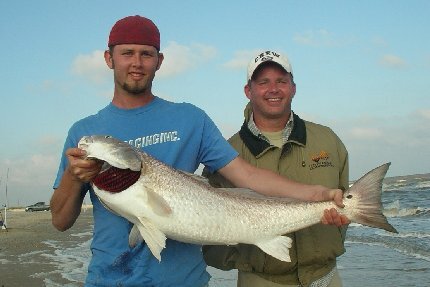 Here are some photos of a couple of Redfish that were caught by Dan Morgan (of Galveston) and Mark Costa (of Redfish street-Bayou Vista). 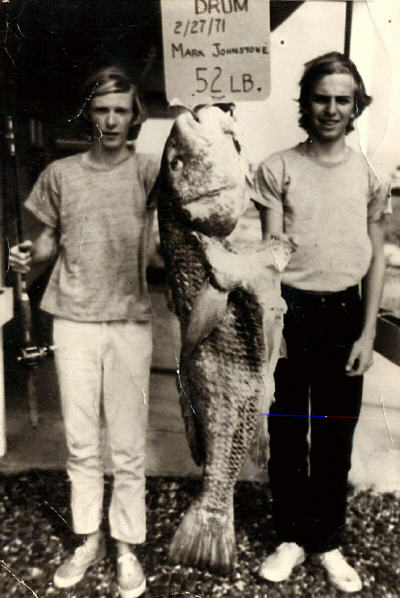 The larger fish was 42" and the "small" one was 39". 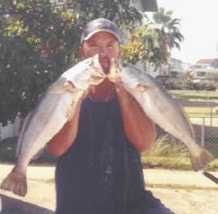 Both caught at the Galveston Jetties October 2005. 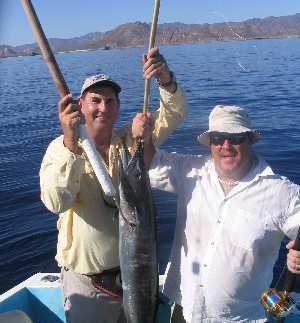 Here are a couple of photos from my recent trip to the East Cape of Baja, Mexico. 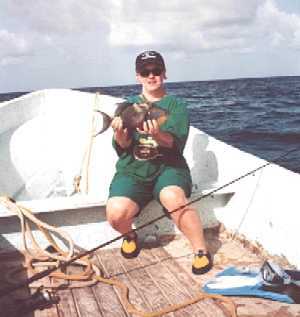 Ruth Ann Marr, Texas Lady Angler on Pompano. 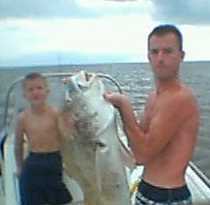 Joe Mims at top left holding a giant squid caught a lure. 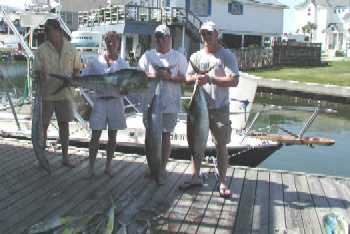 Joe & Doug Mims with wahoo at top right and sailfish on the left. Melissa Foster, daughter of Tommy & Shirley Hall was one of the winners at the Bayou Vista Summer Festival in 2005. 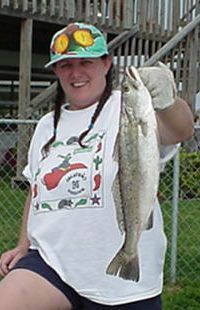 She won first place in the speckled trout division. The fish weighed in at 6 lbs.  15.8 oz. 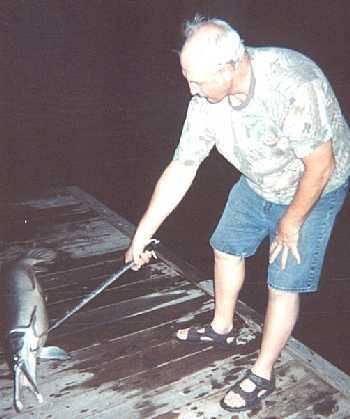 28 lbs 40 inches Jack fish in West Bay, summer of 2005. 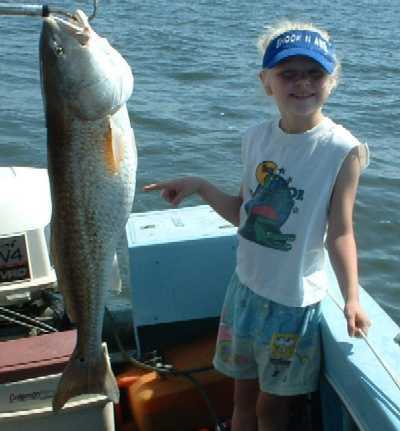 On Saturday July 23rd, 2005 a father - daughter fishing trip took place 45 miles south of Galveston Island. This was a first time offshore trip for the girls. In the photo on the right is Ricky & Kayla Tibaldo, Gary & Kelli Blecher, Joe & Kinsey Mims. 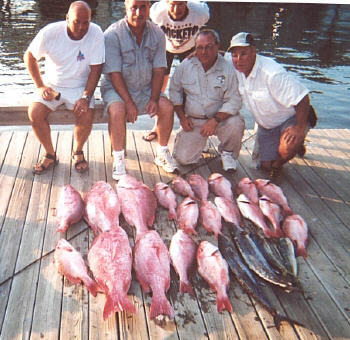 They had a nice haul of Red Snapper up to 15 lbs, 3 Kings and 2 Dorado's. 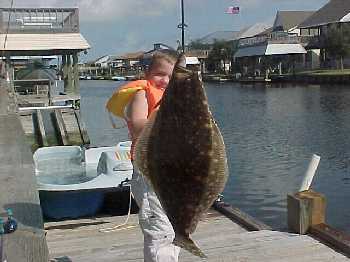 My grandson Cole (5 yrs old) caught this big fish this week while visiting us. 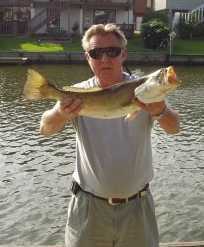 It is the first time he has caught any fish at all. This one was 28" and weighed 8 lbs. 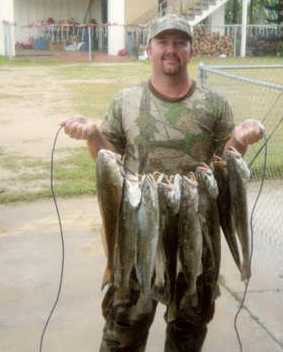 He caught 3 others too. 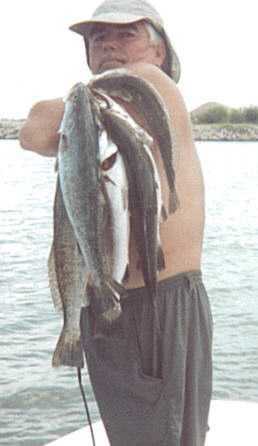 Jim caught some too. They caught them in the canal at High Noon! 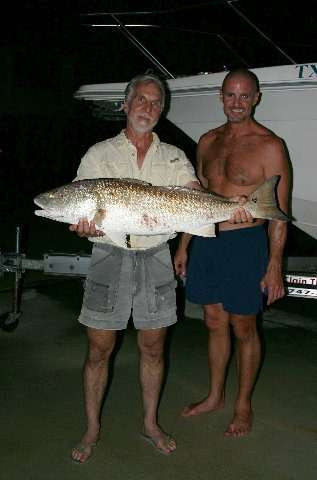 George and Pattie Moore's nephew, Sam Weathers, who was visiting from San Antonio, caught this big drum in Jones Lake over the 4th of July week-end. 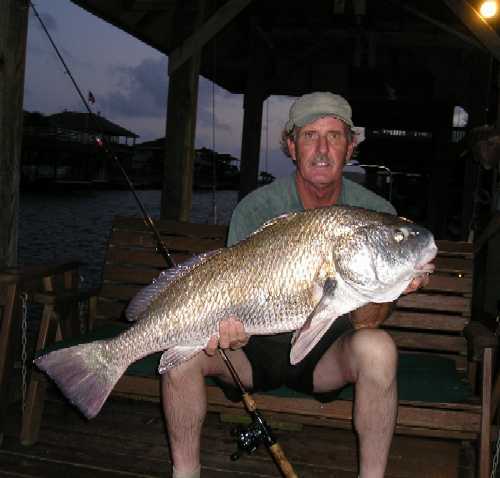 He was using live shrimp, the fish weighed in at 34.5 lbs. and it took Sam approximately 45 minutes to land him. Great fun!! will be more to follow from Baby Kenner and Dad. 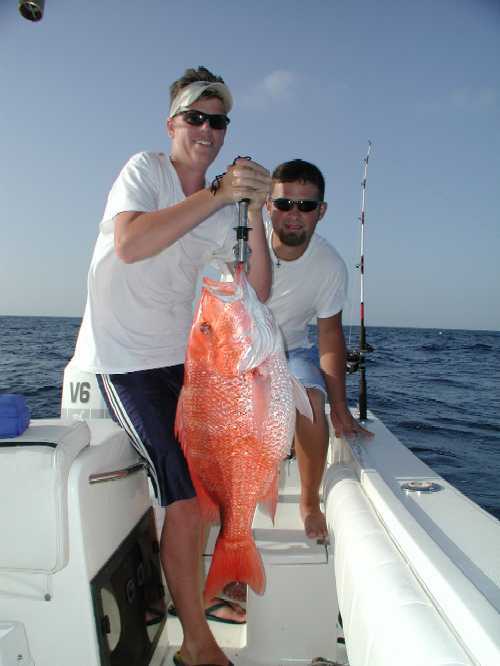 leading Red Snapper that weighed 23# 14oz., caught 45 miles offshore. Rob Walker took his 6 year old daughter Melanie out to West Bay in 2004. She caught her first red bull that weighed almost as much as her at 35 lbs. 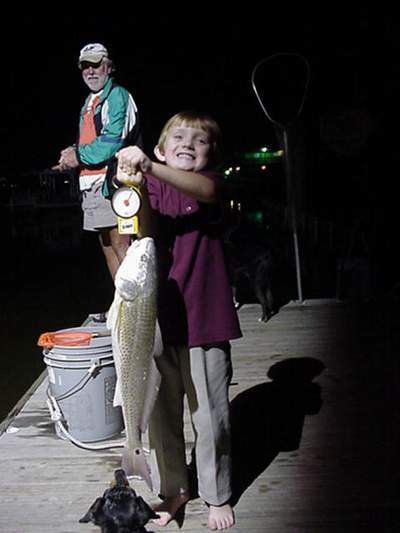 Cole Johnstone caught this nice 24 inch red off the dock of his house Nov. 2004. 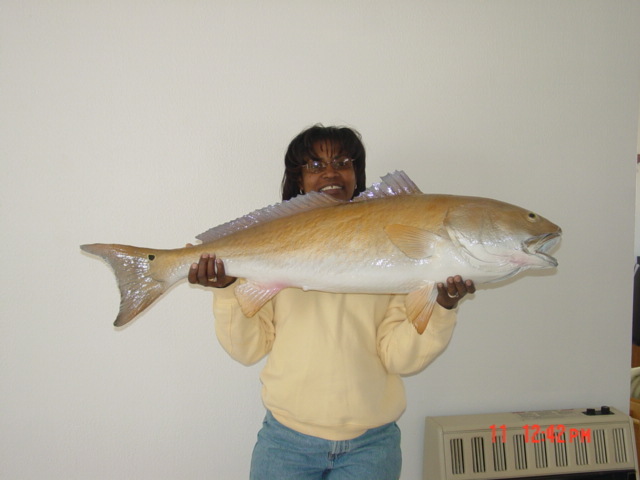 Tommy Hall of Ling caught this 40" redfish, in Galveston Bay out of San Leon (Spring 2003). 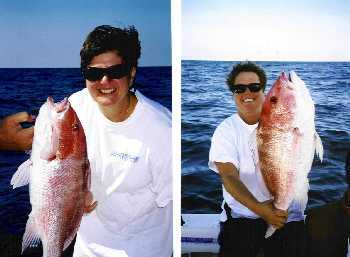 Robbyn White above on left with tagged bull red fish caught October 2003, on right she is holding a trigger fish caught in Southwater Caye in Belize July 2004. 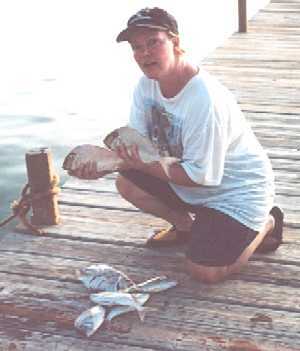 Bottom left another good day of fishing in Belize and on the right trout caught June 2004. 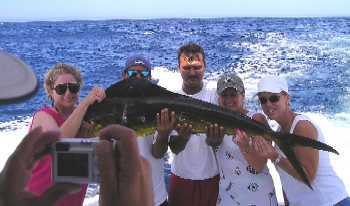 Christie Stepchinski and Kim Bourassa in Cabo with dinner summer of 2004. Mike Scott & Steven Scribbles, a day at the jetty. 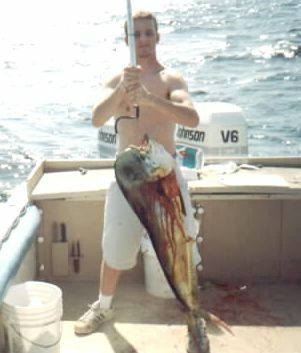 Trout, Sheepshead, and Spanish Macs, summer 2004. 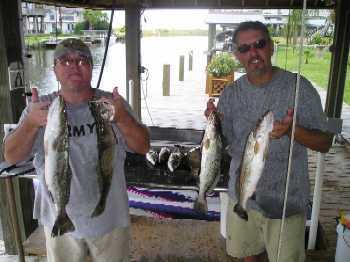 Bill Andrews and Sam Valchar had a good evening fishing Jones Lake (Sam's Island). 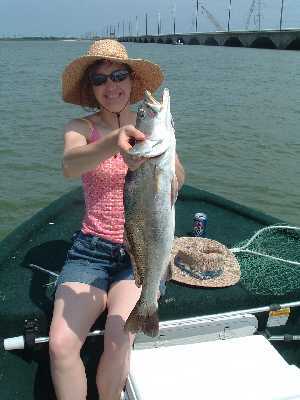 Biggest was this nice Trout at 27 1/2". 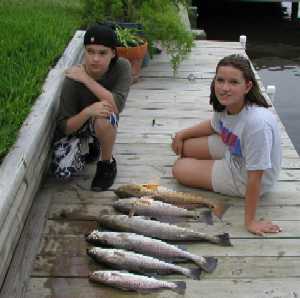 Joshua Doolin visiting from New Jersey with his cousin Kacie Cisneros with their Uncle Sam Valchar caught these at Sam's Island in Jones Lake 6-28-04. 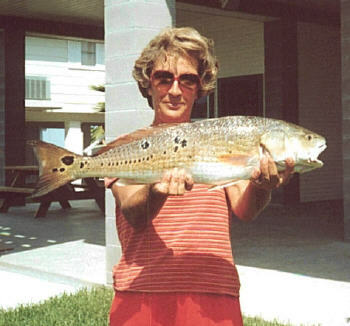 The biggest trout was 27 1/2" and the biggest red was 24". Fun was had by all. 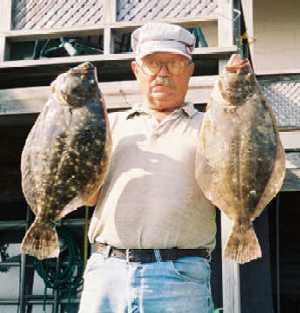 Charlie Hart caught these nice flounders in Jones Lake while fishing with Bass Assasins in the winter of 2004.
the nice stinger on the left and the ones above in 2004. 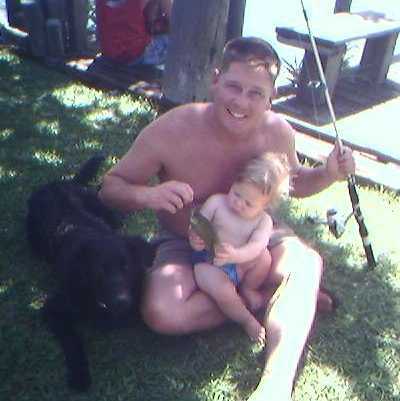 This photo was taken XMAS eve 2003 wade fishing in West Bay. A former Bayou Vista resident, now in PA, Sue and I come south every XMAS to be with our family. Always a main part of the trip is to spend as much time as I can with our former BV neighbor Ray Chapman (now in Galveston). 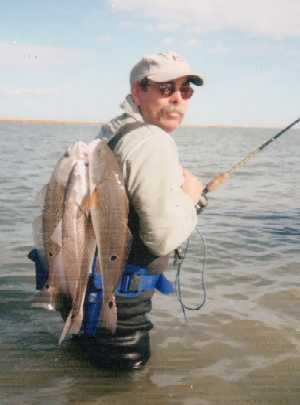 Ray taught me the ropes of winter Redfishing in West Bay. 150# out of Venice, LA. on Jan.28th 2004. 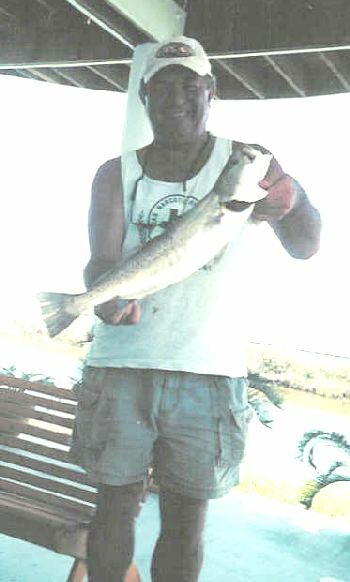 Mayor Kenyon Courtney went fishing aboard "Antique Glass"
owned by Fenton Hutchison in August 2003. He purchased this off shore trip at the BV Summer Festival Auction. his brother and brother's son. 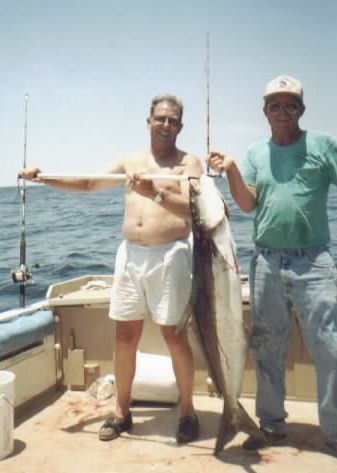 Tim ever caught (he just moved down here from Chicago) and the other is an amberjack he caught June 7th, 2003. 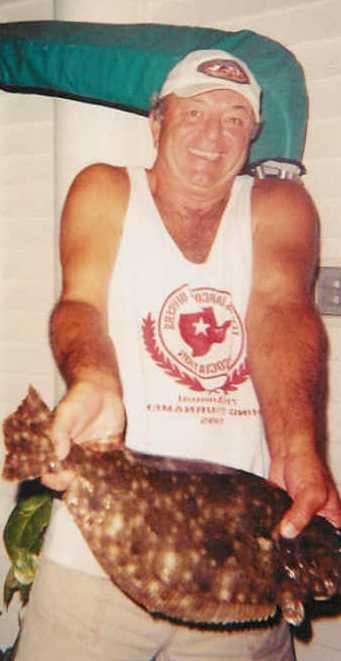 Ray Simpson & friends caught the above fish at Boom Vang 130 miles south of Freeport April 2003. 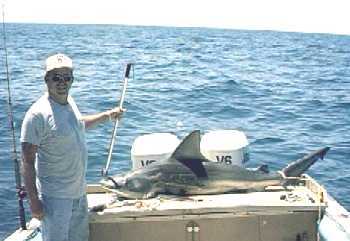 L. D. Robinson from 1141 Sailfish caught this 150# bull shark (approx) 4/27/03 offshore at Buccaneer Field. 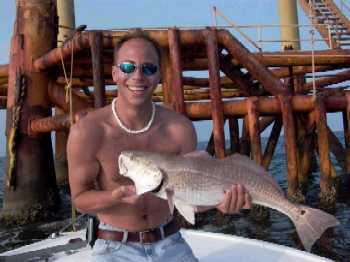 he caught February 15th, 2003. 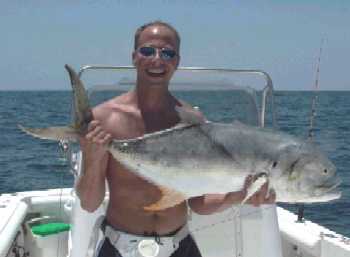 Stephen Wilson caught this Dorado in Cancun Mexico about a mile offshore summer of 2002. 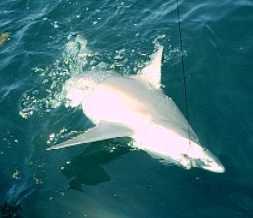 It put up a fight for about 30 to 40 minutes & weighed about 45 to 50 pounds! 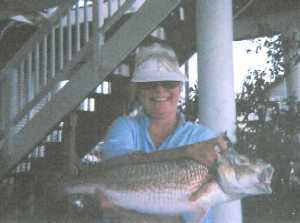 The fishing lady on Blue Heron, Beverly Bielamowice caught this 8lb. 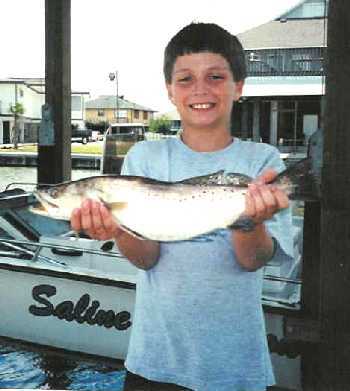 redfish, 2002. Jim Kirkendall has some bragging rights from the summer of 2002. 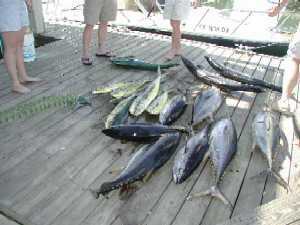 The King Fish (above on left) weighed 34 lbs. 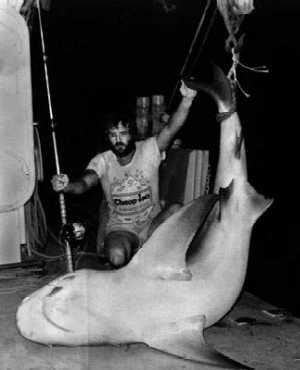 & was caught 20 miles offshore off of Galveston. 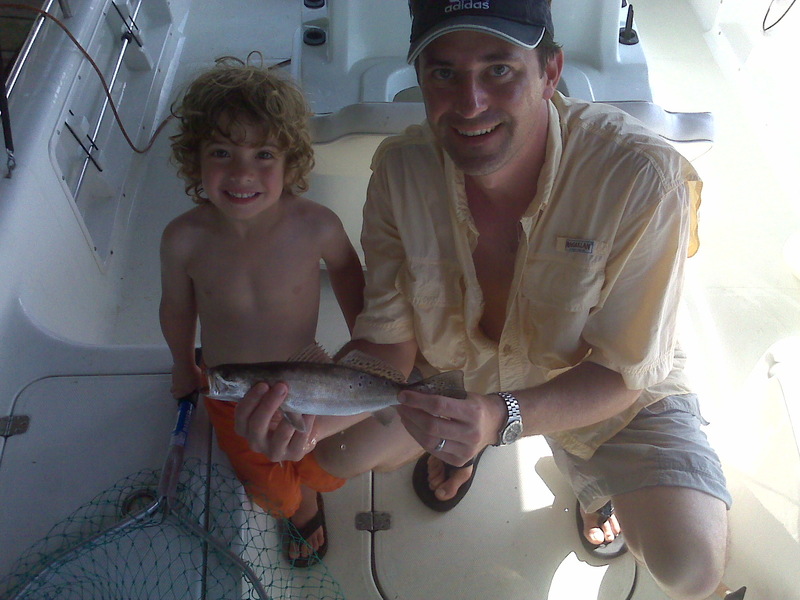 The trout & redfish came from the South Jetties & wade fishing by Pelican Island. aboard Joe Mims boat Oct. 11, 2002. Here's the 39 lbs. 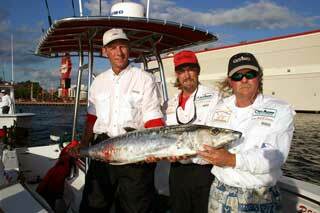 Kingfish Mike Hartman (on right) caught during the Teakwood SKA Tournament. Mike placed 2nd overall and 1st in Class of 23. He says "It was a good finish to a slow tournament season for us". 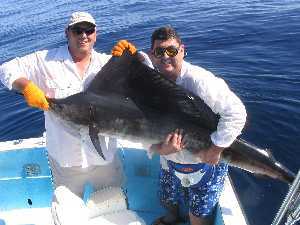 Ask Ed McKenzie, who everyone knows from Vista Video about his fishing trip with Billy Gibbons (from the group ZZ Top). 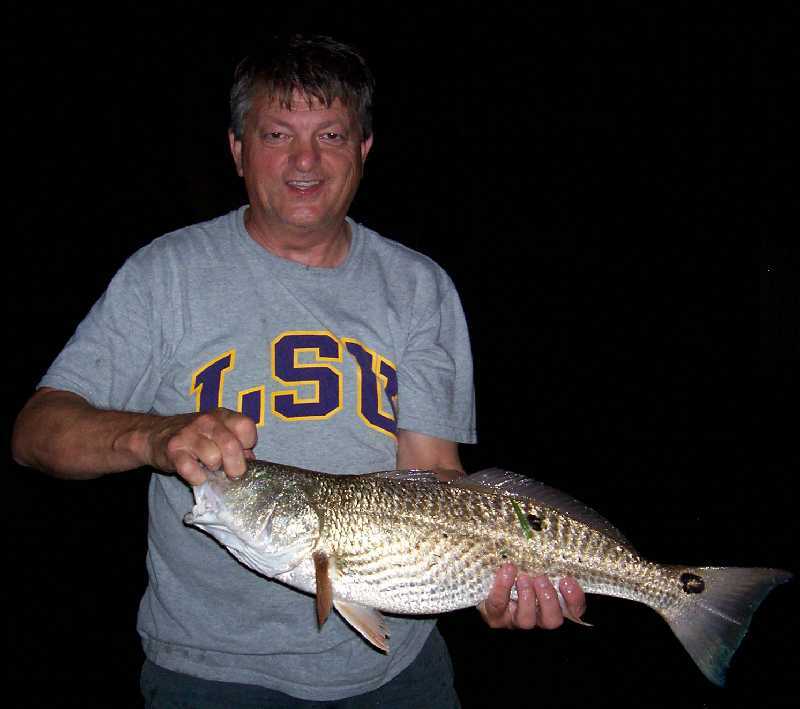 By the way Ed, What did yall catch? 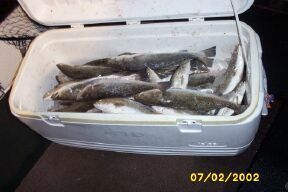 they caught 50 miles off shore Oct. 2002.
three times at night & have limited out on the specks each trip. by Fenton "Hutch" Hutchison & his nephew Marty June 15, 2002. 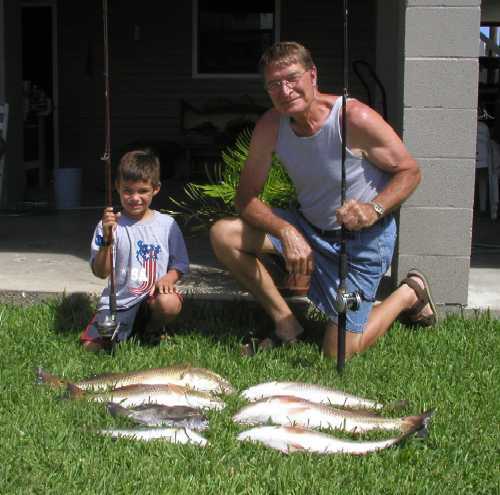 Vic Greetz & Grandson Trey caught these nice speckled trout weighing 4 and 6 pounds in June 2002. 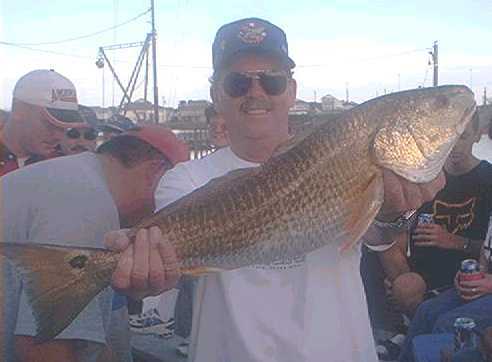 This is the redfish that TJ Folk caught. 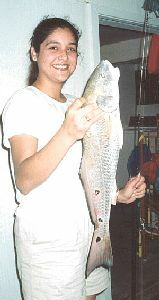 She won 2nd place for the Lady Anglers prize of $100 during the Summer festival Fishing Tournament 2002. 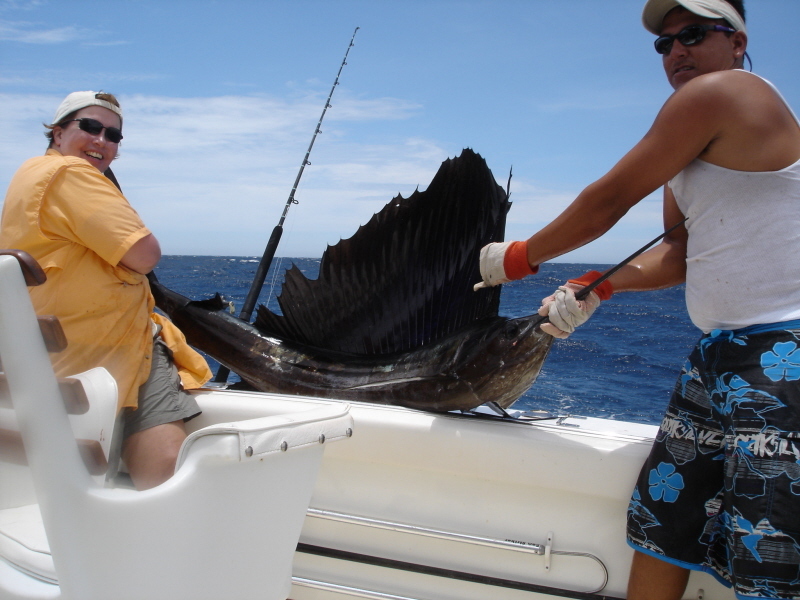 Ross caught this fish in November right in front of his house on Bonita. 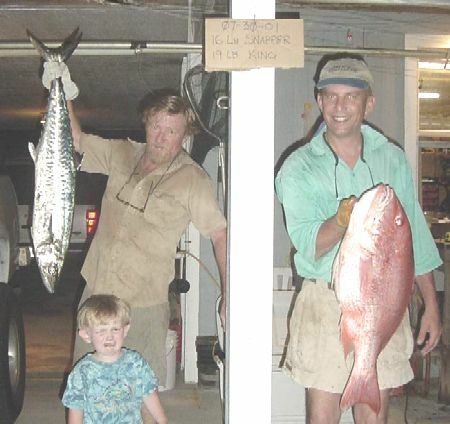 Joe Mims & Vic Greetz show off there off-shore catch from 10-20-01. 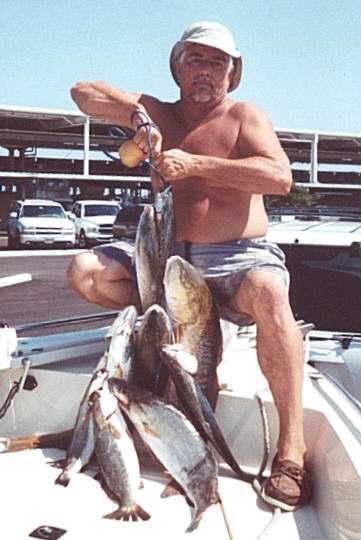 They caught over 100 red snapper, keeping 4 each. 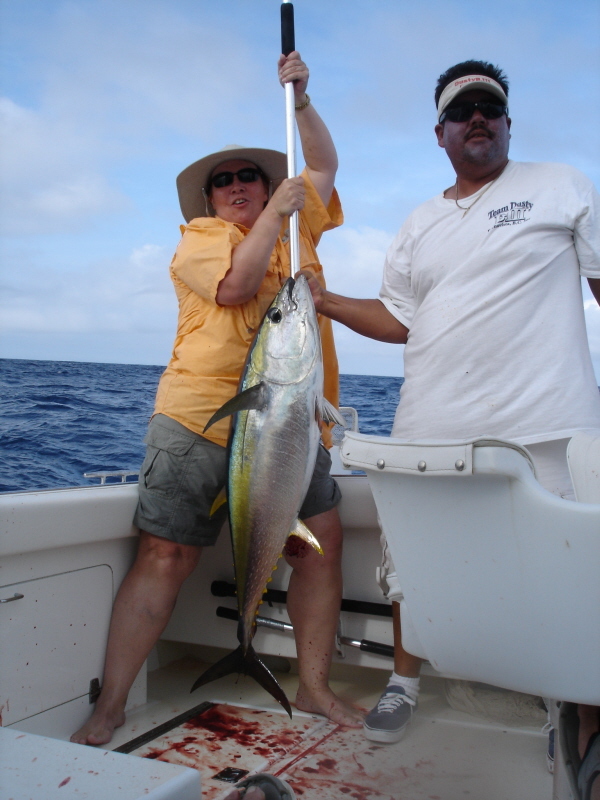 Joe caught the 17 pound Dorado on a 10 LB test line. 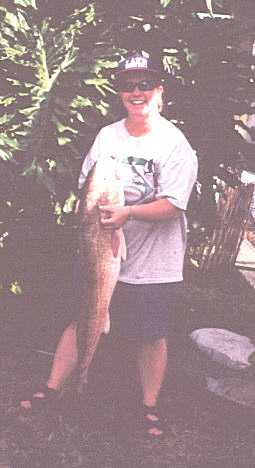 Christine Hegman catches her 1st redfish. Austin Bumpas displays a nice red both caught on Tarpon. no it was not caught in the canal! 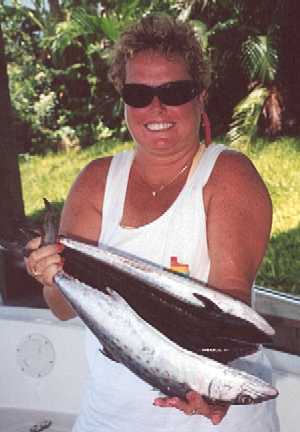 Vicki Howard (holding the fish) & Cindy Golian caught 4 Spanish Mackerel, & 7 Trout recently at the end of North Jetty. 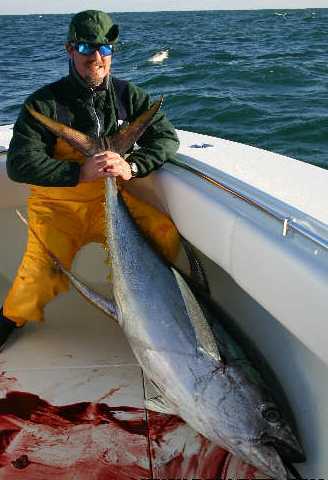 Your bait just can't be to big! 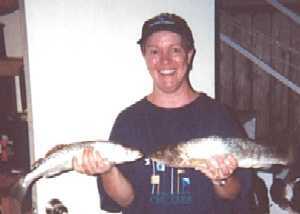 Joe & Debby Wilkie of Bayou Vista caught these nice 25" & 27" redfish at Old Intercoastal between Deer Island & Greens Cut.